A range of hills in East Lothian, the Garleton Hills lie to the north of Haddington. They rise to 186m (610 feet) at Skid Hill and include Bangly Hill, Barney Hill, Byres Hill, Craigy Hill, Pains Law, Phantassie Hill and Score Hill, which are all formed from volcanic rocks of the Lower Carboniferous period formed as lava some 335 million years ago. 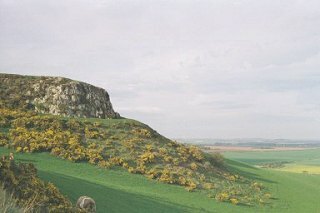 The Hopetoun Monument stands at the centre of the range.